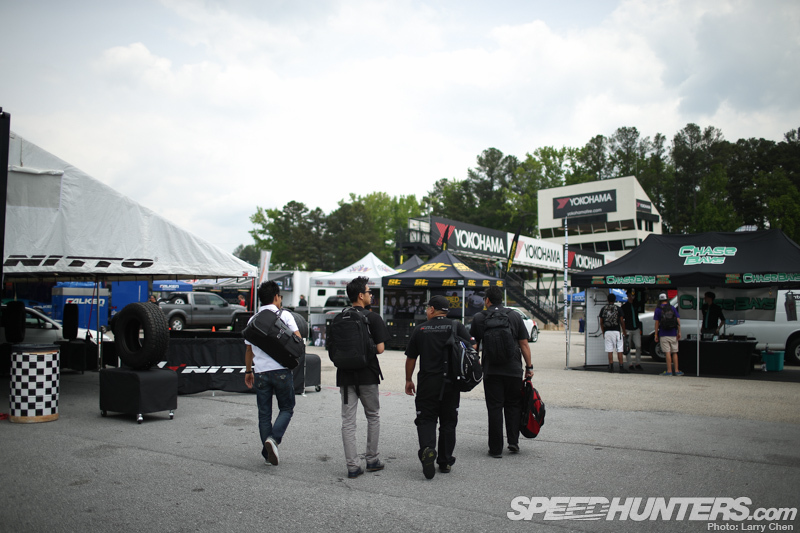 Each and every one of the drivers on the Formula Drift grid do it for the love of the sport. They just love being behind the wheel. Then again, are there any professional racing drivers whose sole purpose for driving is for fame and fortune? I’ve thought about it til my brain started to hurt. It really just comes down to doing what you love, whether you make a living from it or not. 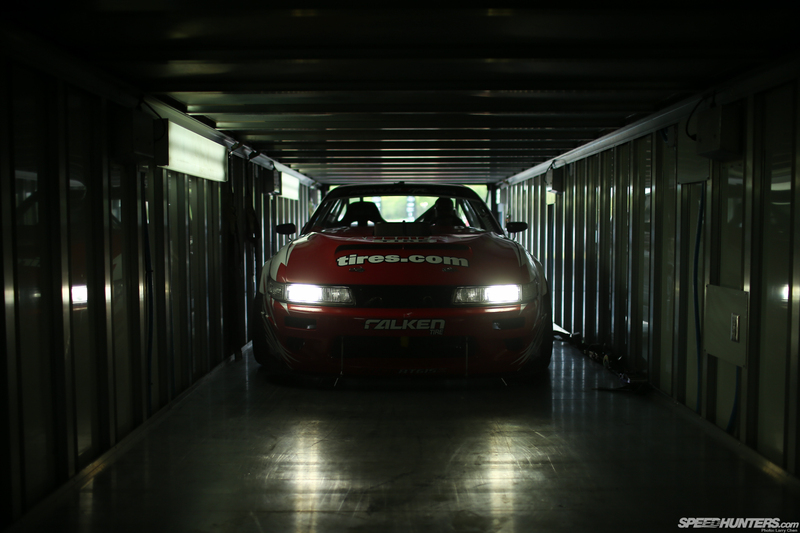 I wanted to do something different for the second round of the Formula Drift Championship series in Atlanta. I wanted to follow the points leader, and a driver that is last place in the standings. The number one driver after a single round of competition happened to be Daijiro Yoshihara. Although, I ran into a little dilemma as there were quite a few drivers with no points at all since many of them did not make it into the top 32 bracket in Long Beach. So out of all the drivers on the bottom of the standings, I picked Brandon Wicknick. 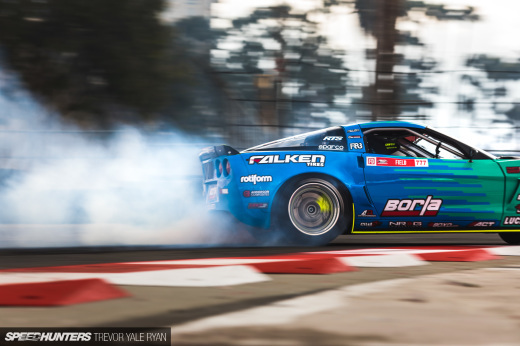 He’s the epitome of a Formula Drift privateer who also happens to be a rookie. Like many up-and-coming drivers, I’ve been following his efforts since 2009. Even though these two drivers technically drive the same chassis, they could not be more different. 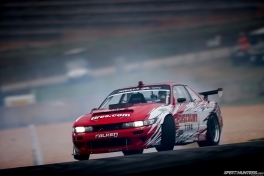 Dai’s S13 is powered by an LS7 V8 and is the most developed S-chassis in the world. It was built by SPD Metal Works. 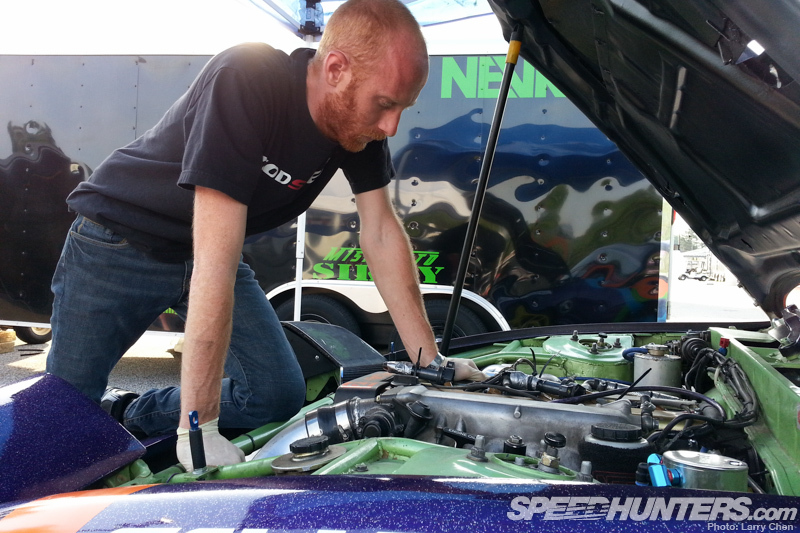 Brandon’s steed was built by himself at his personal shop and is powered by a 2JZ. There’s still much room for development to make this car more competitive and reliable. I know what you guys are thinking. It’s not fair that I’m comparing Brandon to Dai right? Well what about when Dai started driving? He was once a rookie too. 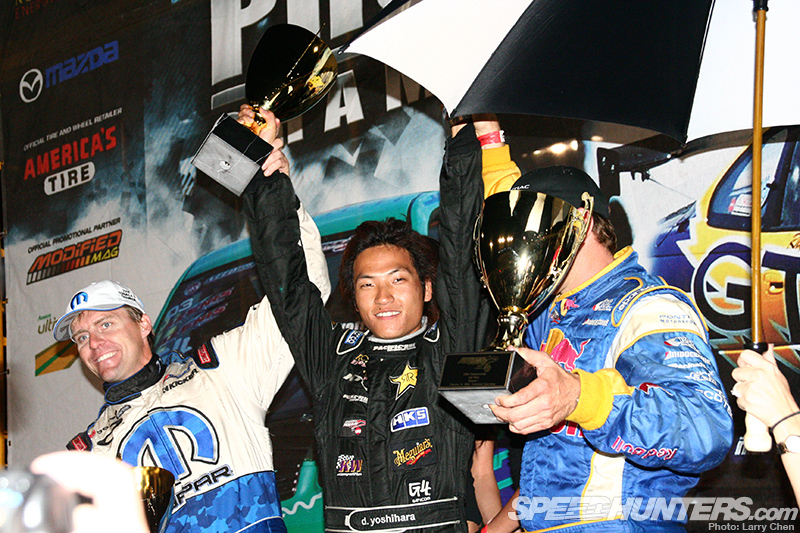 Back when Dai earned his first ever Formula Drift victory in 2006, he was not driving for a living. 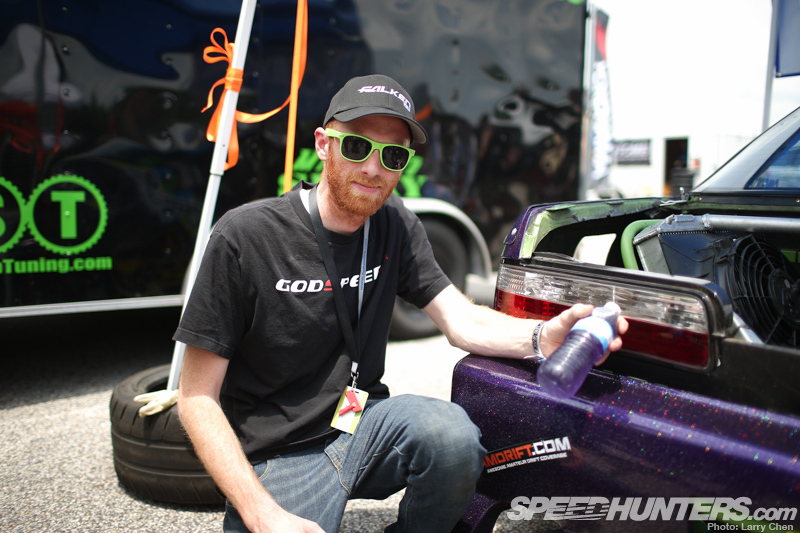 He was barely making ends meet, pursuing his dream of driving drift cars as a career. Now he has eight wins under his belt; just one shy of equalling Samuel Hubinette’s record for nine wins. I think that both of these passionate drivers were in the same boat at one point in their lives. When I first met Dai he barely knew how to speak English, but he still loved to have fun. After eight years he’s still largely the same person; he still loves to joke around. Although after eight years you’d think I’d have learnt how to expose a photo properly! The first time I met Brandon he blew me away. Just like when I met Dai, I got the feeling that he just liked to have fun. 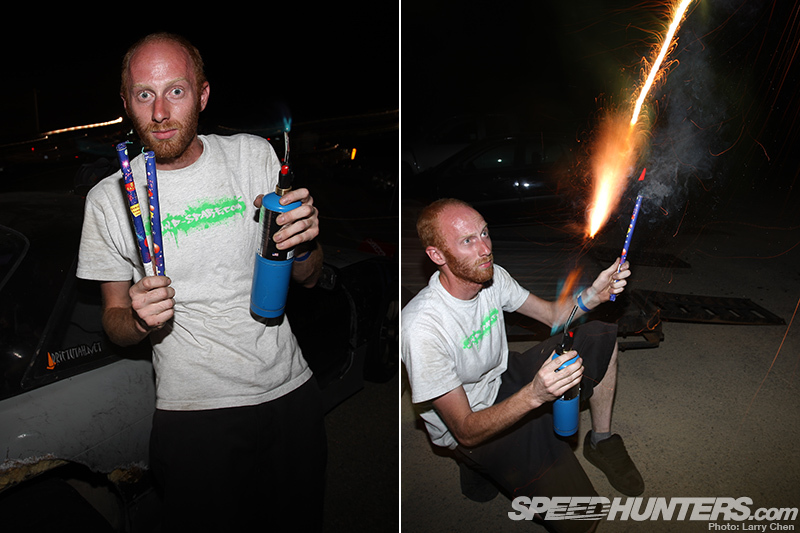 Brandon lives in Utah, but he tows his drift cars twelve hours away to Southern California to drift. It wasn’t cheap, so to save money he slept on the roof of his two vehicles. No joke. 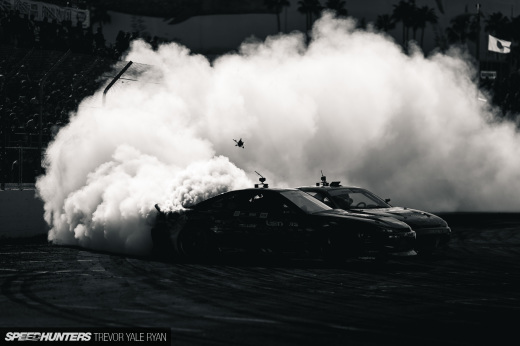 Recently there’s been a surge of rookies in Formula Drift, and while I like the fact that the field is growing, I don’t like to see drivers come out that are unprepared for the rigors of pro competition. It makes the sport look bad. Brandon has been competing four years in pro-am. Even though he earned his license back in 2012, he waited a year and competed some more, just to make sure he was ready to duke it out with the pros. No matter how prepared you think you are, there’s always some oversight. 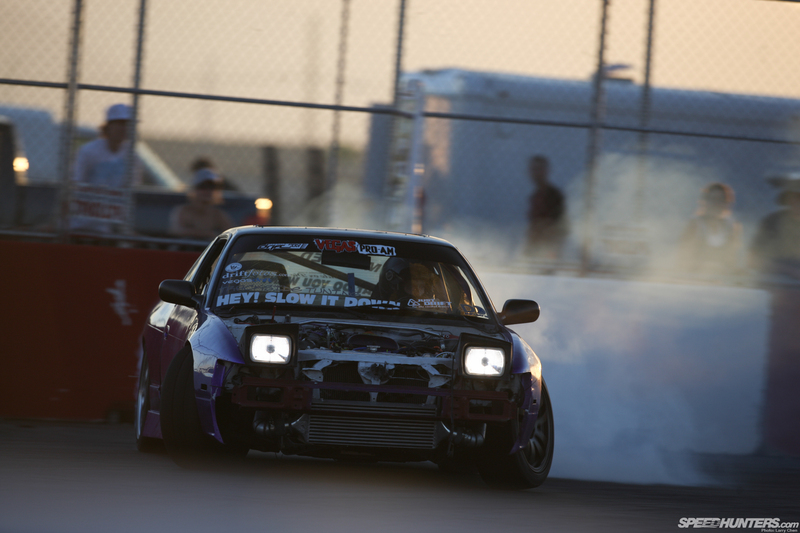 In Long Beach Brandon’s S13 made too much smoke and he could not see as it filled up his cabin instantly. On top of that he was having ignition problems which he didn’t figure out until after the event, so didn’t qualify in the top 32, as the car would not drift. By the time Atlanta rolled around he fixed his ignition issues and plugged all the holes in his car so he could actually see where he was going. He was also sporting a new paint job, which he did with the help of friends the night before trailering his pride and joy across country. 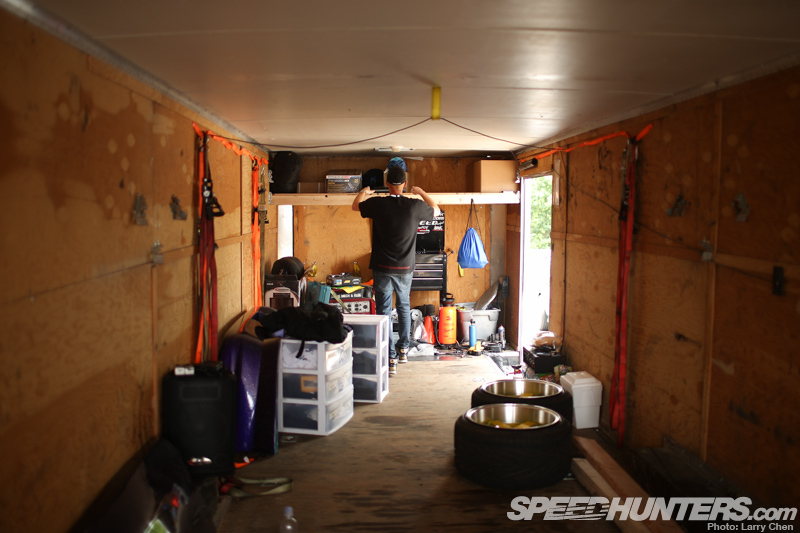 Once Brandon and his two close friends arrived at the track they unloaded and got ready for practice day. They were planning on sleeping in the two car trailer, but Road Atlanta does not allow camping, so they ended up getting a motel down the road. Unlike many of the other privateers out there, team Wicknick learned from watching the pros. They’d brought anything and everything in terms of spares, including extra body parts and a plethora of freshly painted wheels. They’d even trailered their very own pit vehicle. 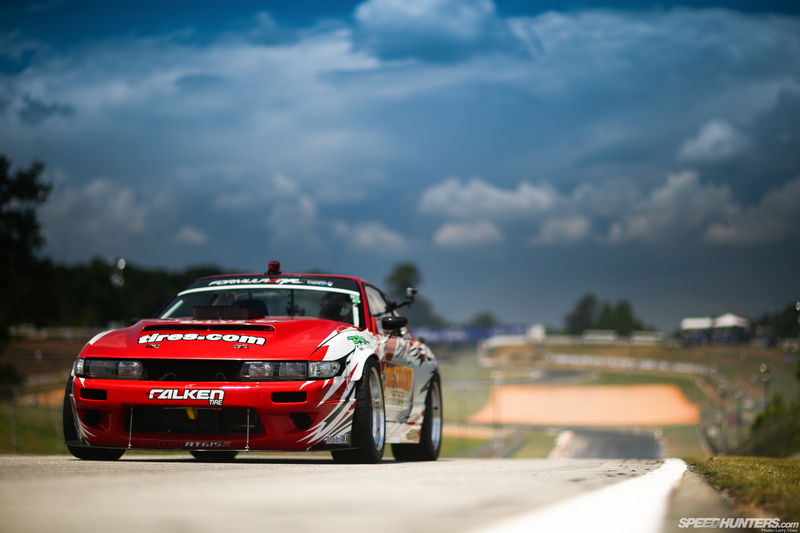 Like Daijiro, Brandon’s also running on Falkens, however he’s on their racer program, which allows him to purchase tires at a discount and in return Falken provides track support. He’d never driven this track so needed all the practice time he can get. Every driver’s goal coming into competition is to win of course, but realistically for the rookie teams it’s about getting that coveted rookie of the year title. Dai’s goal meanwhile was to keep the lead in the points standings and hopefully earn his second championship. 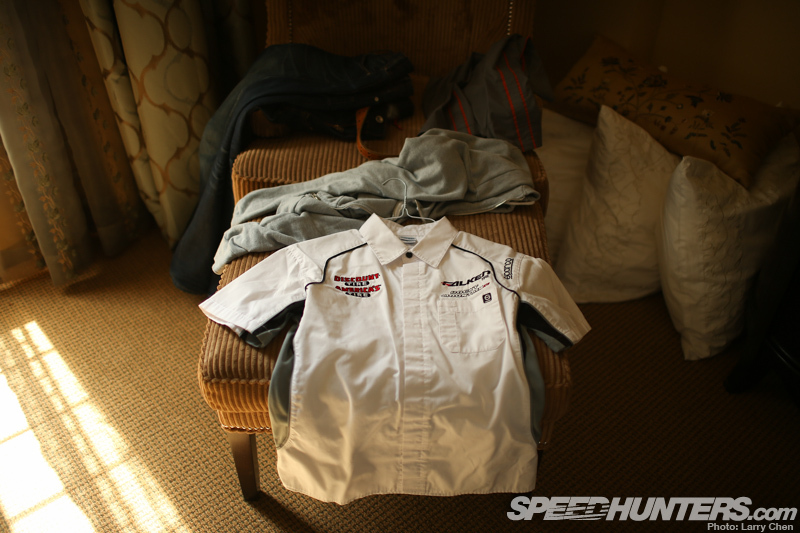 Being part of a pro team means a lot of responsibility to your sponsors, your crew and most of all, your fans. Being a public figure means Dai has the power to campaign for something that he believes in, and Dai believes in helping his home country. I commend him for doing such a noble thing. His efforts could be spent elsewhere promoting himself and his own brand, but instead he spends that extra effort to help out people in need. 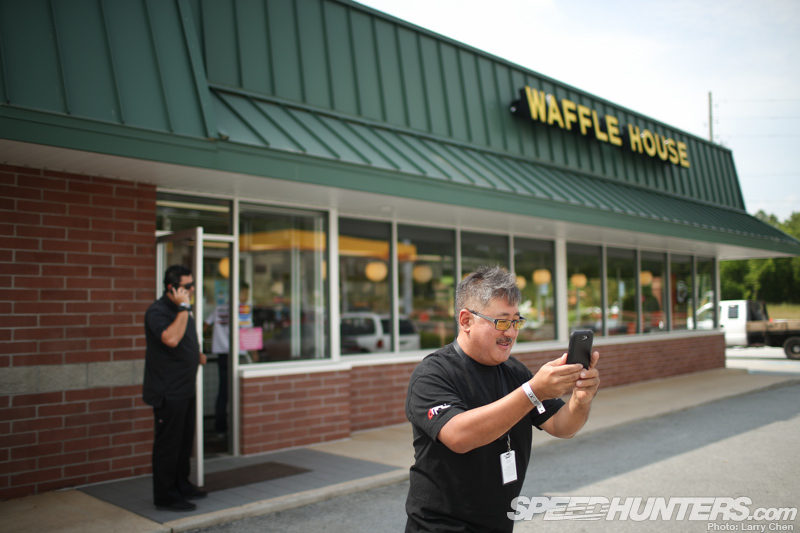 It may be a trivial thing for most of you Speedhunters out there, but at this level of drifting, it’s critical to be camera ready at a moment’s notice. After all, Formula Drift is on national television and you have to represent your sponsors in front of millions of people. I feel Dai’s pain. Next month I’ll sleep in my own bed for four nights. Dai seems to have the same problem. Another weekend means another city or continent. You don’t get to see your family as often as you like. 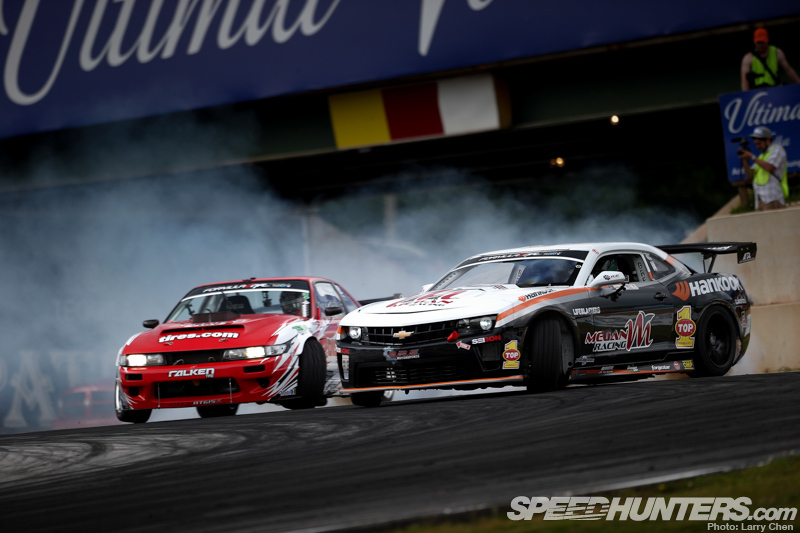 Instead, this is your drift family. 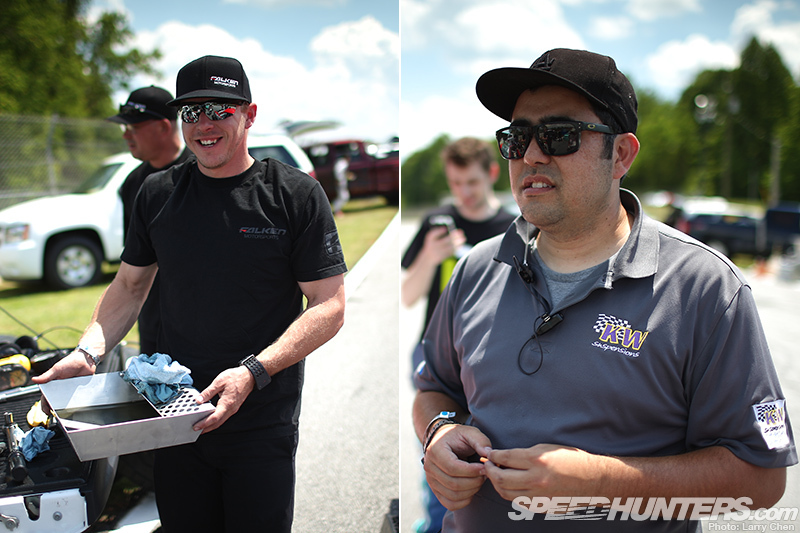 Your crew chief, chassis engineer, PR manager, suspension technician and your video crew. You think I’m kidding? It’s the career that he has chosen and he’s damn good at it. 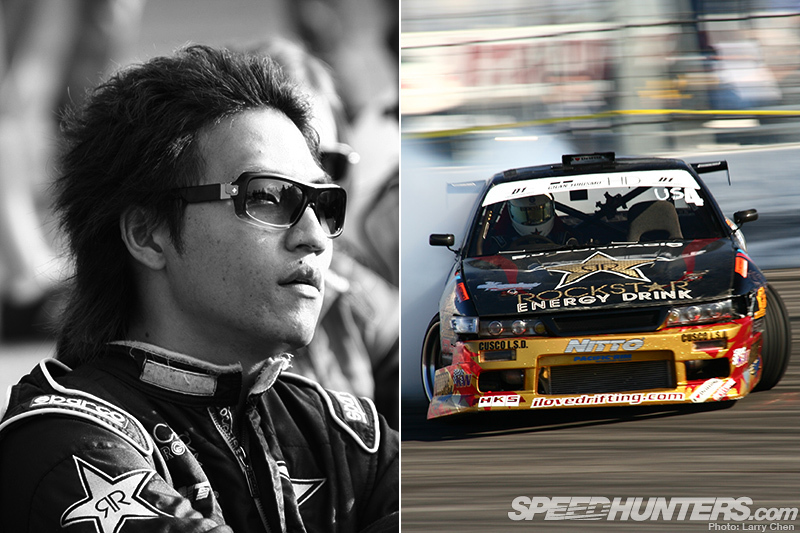 Dai is one of only five drivers who’ve never missed a Formula Drift event since its inception back in 2004. 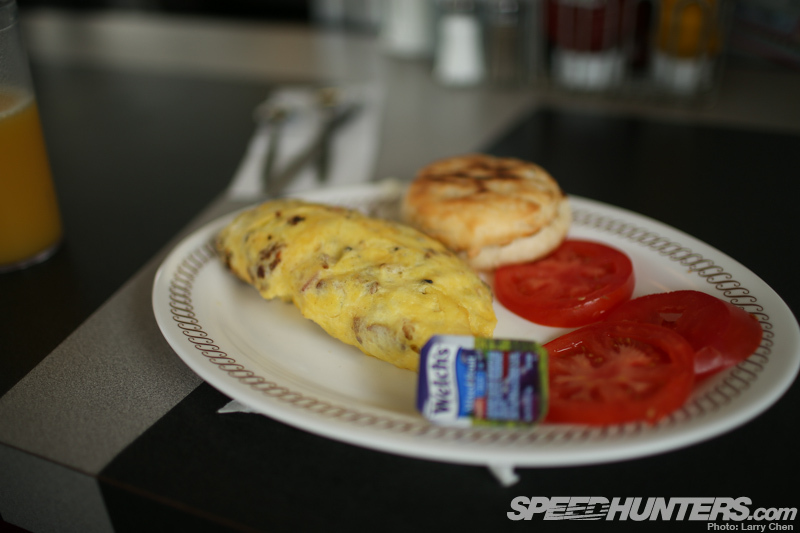 As a tradition he likes to make a stop at Waffle House for breakfast at least once when the team is in Atlanta. There’s nothing better than having a home cooked southern American style meal. 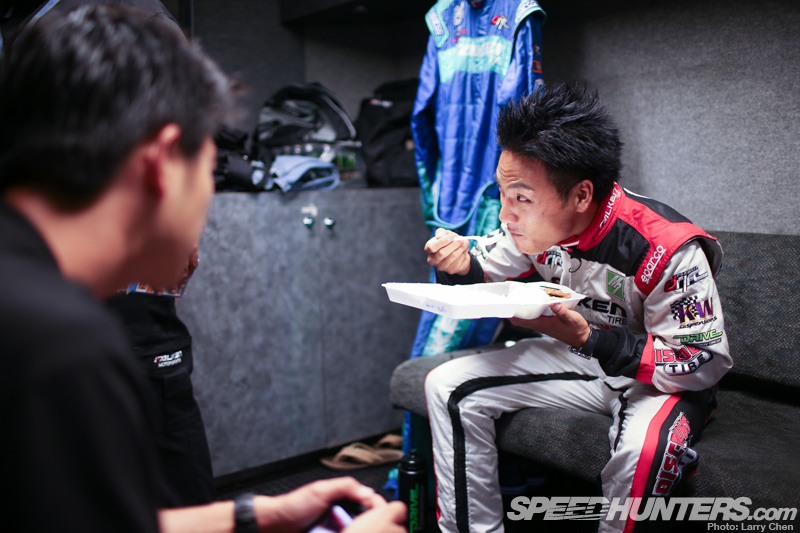 After all, according to Mike Kojima, Dai’s Chassis Engineer and spotter, he drives best with a full stomach and a bowel movement on the way. Also not kidding. I joined the club. It was nice to have a side of egg with my grease. I bet if I picked up that omelette and rubbed it against the wall, I could see through it. There were many “Are you going to eat that?” moments. This was also the perfect time to talk strategy for the weekend. Normally the team would start off with a mild setting and go harder as the day went on. But because of the new qualifying layout the team is now forced to run a set-up that’s all or nothing to qualify as high as possible. 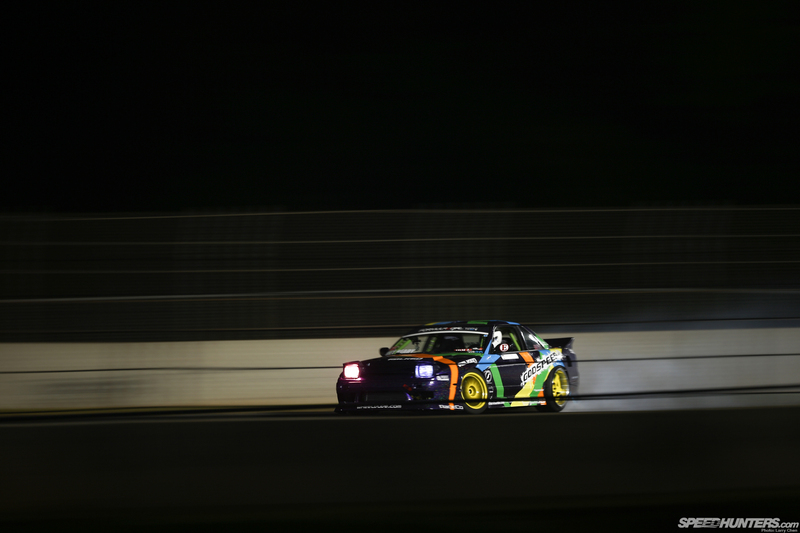 It worked very well in Long Beach as he qualified first. It was time to wake up the beasts from their slumber. Practice was coming soon and qualifying followed right after that. The pressure was on for Brandon and the crew as they’re yet to qualify for the top 32 and they’re going for broke this time. The motor had a re-tune which bumped it up from 500whp in Long Beach to 600whp. 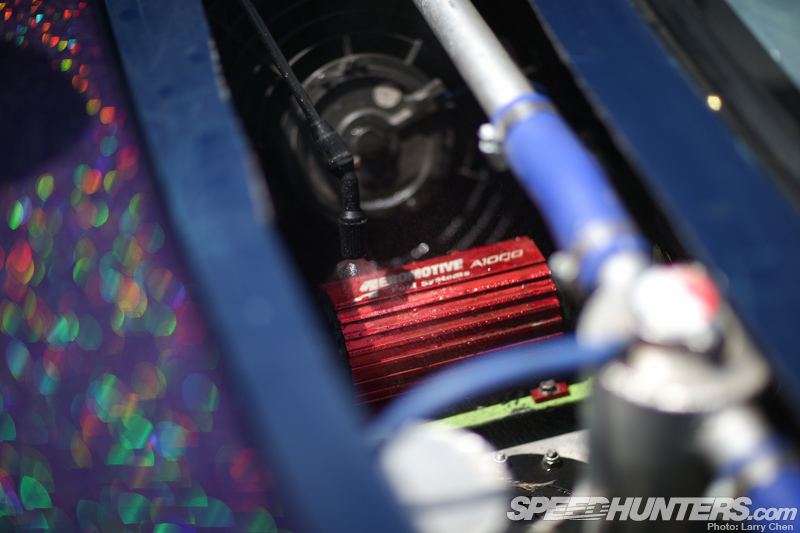 They had to change a fuel pump and steering pump in practice, but luckily the team knew exactly what they need to bring in order to keep this car running. Just to be safe they also changed out the diff and put in brand new axles to take the abuse from the added power. Brandon’s day job is at his shop, where he converts petrol-burning cars to run on compressed natural gas (CNG). He travels the country teaching others how to do the same. 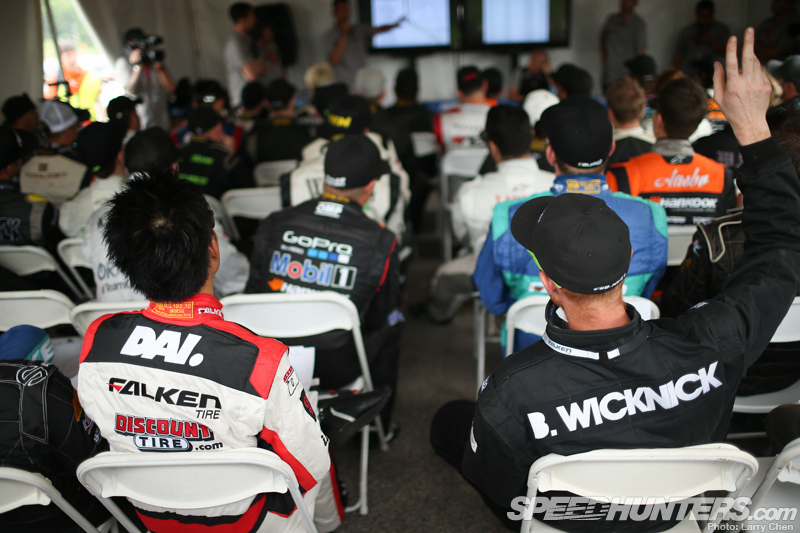 He modifies his teaching schedule to match the Formula Drift tour, so he can teach in the vicinity where he’s drifting while he’s out of state. 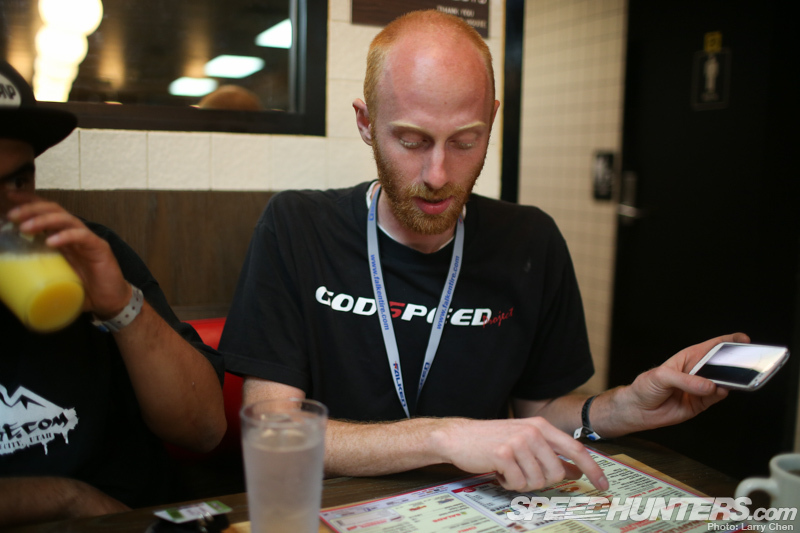 These two men are worlds apart, but they are largely the same in that they both have an undeniable passion for drifting. Just a few minutes to go before open practice was a perfect opportunity for Dai to get a quick lunch in while having a little team meeting. Scott Dodgion, crew chief and all around fun guy has a full plate this year as he has to run a two-car team. It won’t be a problem with the help of these ringers though. Christopher Marion from KW Suspension travels from series to series just providing race support. 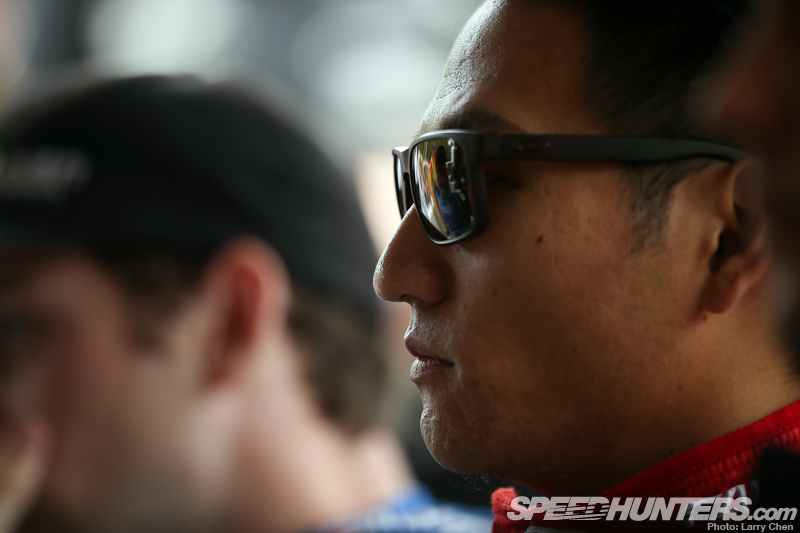 Dai mentioned that before, when it was a single-car team, it was like being an only child as he got all the attention. But now it’s kind of like he has a younger brother. He also mentioned that in a way it’s great to be able to share technical data and spare parts, but now there’s a sense of competition between the two. However, he also said that he would much rather have D-Mac than anyone else as a teammate because they’re close like brothers and he wants to see him do well. 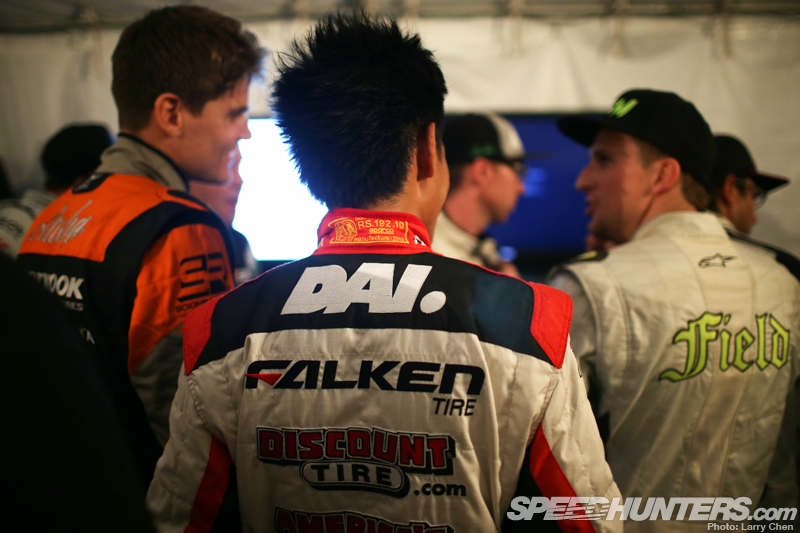 Brandon does not have the kind of support that Dai has, but he still has a network of friends that have been with him since the beginning of his drifting career. I don’t care how talented you are, there’s no way you can run a one-man show. During practice the car started to cut out, and the team figured it was the fuel pump overheating. Between every run they sprayed it down with cold water, and for qualifying they brought towels from their hotel and soaked them in ice water. In between runs they would wrap the towel around the fuel pump – it worked like a charm. The suspension is so finely tuned on Dai’s car that sometimes he can’t even feel the change, but the extra Gs that they pull can be clearly seen on the data logger. By the time qualifying rolled around, the team had found the optimum setting for the track and conditions. Unfortunately for Dai, things didn’t go too well. He didn’t qualify as high as he’d hoped and ended up in 15th place. The next day he was paired up against Conrad Grunewald. This was probably the most stacked top 32 battle as most of the other battles were fairly one-sided. This could have very well been a finals battle. It was close, but Conrad moved on. Dai would not make it into the top 16. 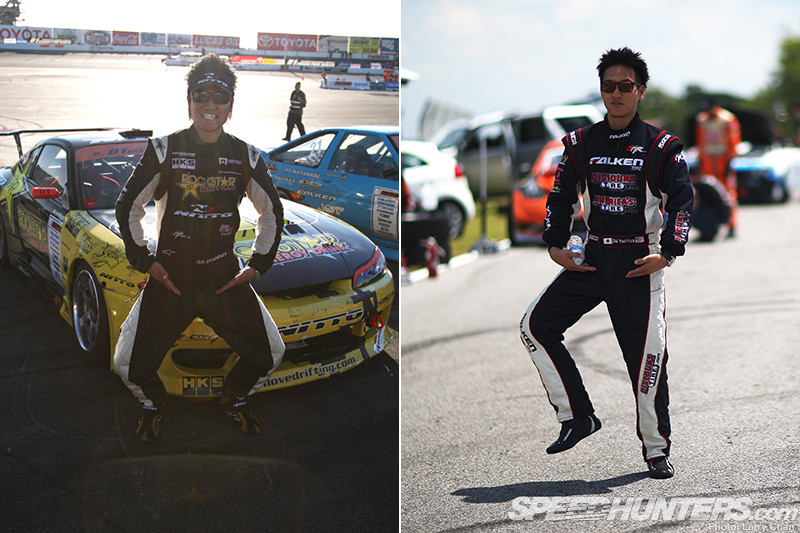 That bumped Dai down to fifth in the points championship. He’s now 35 points behind points leader Vaughn Gittin Jr.
Brandon went out for his first qualifying run, but hit a clipping point. 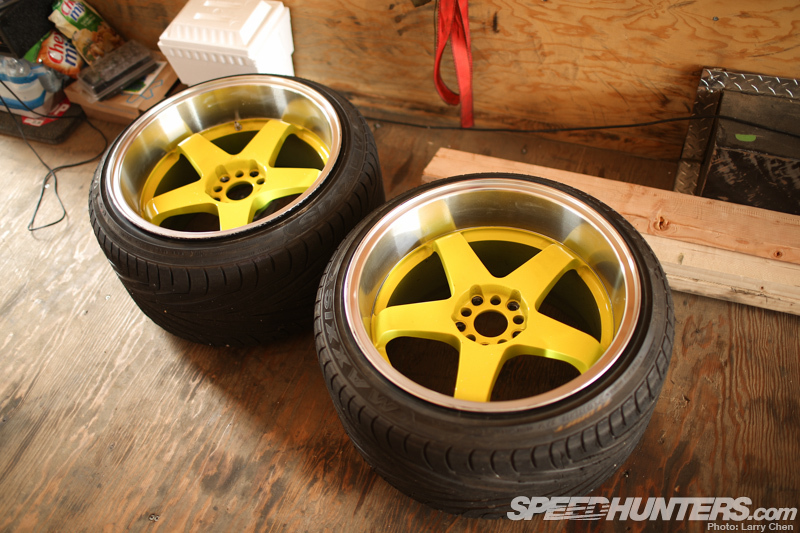 He also went one tire off, and was given a zero based on Formula Drift’s new two strike rule. Because he didn’t qualify on his first run he got one more chance to make it into the top 32 and secure one of the remaining slots from 16th to 32nd place. The run was barely enough for him to tie with Walker Wilkerson for 32nd place. To break the tie Formula Drift awarded the 32nd spot to the driver with the higher entry speed, which happened to be Walker, by just a hair. Well I’d started my day at Waffle house, so figured there was no better way to end it. The team was really bummed about getting THAT close to being in the big show. Drifting’s in our blood. 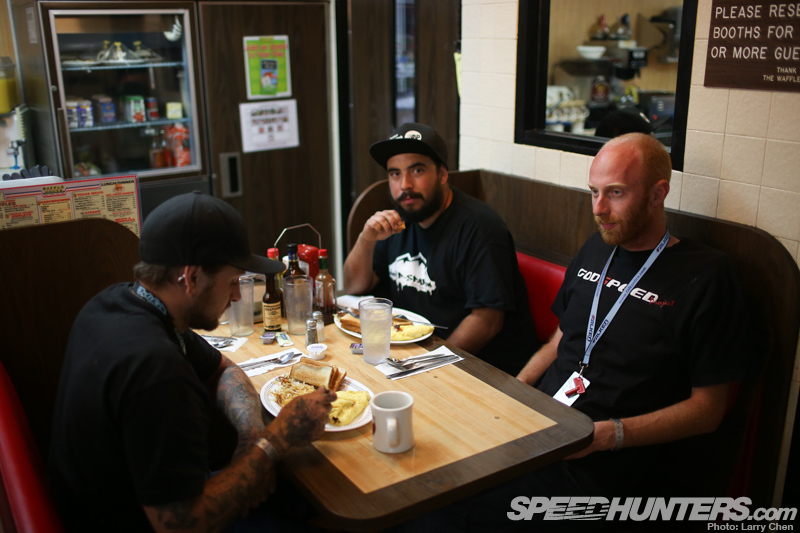 I know this because we’d just come from a drift event, and these boys were super bummed about not making it into the big show, but all we could talk about over some waffles was kicking clutches, burning rubber and making circle burners… it was endless. Some people just have their off days; Dai on the other hand typically doesn’t have those. 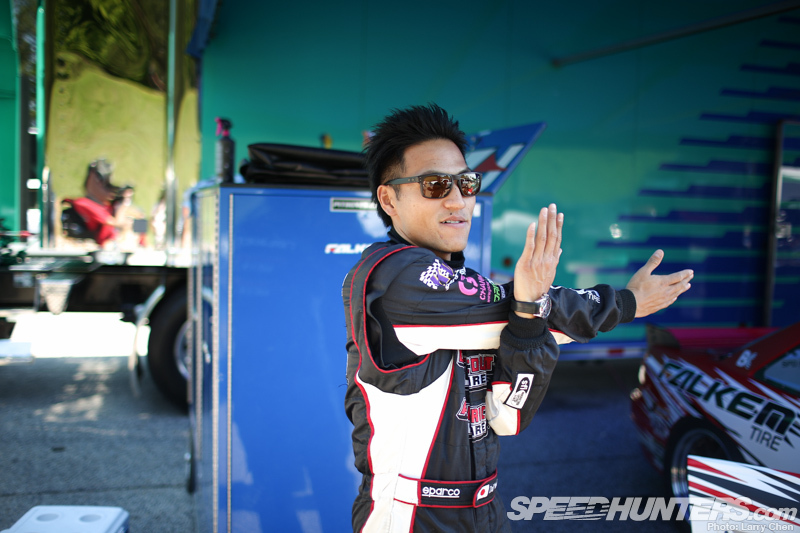 Mike Kojima jokingly said Daijiro Yoshihara is a drifting savant. He almost never practises outside of competition. Dai did mention to me that ever since they changed the layout of the course last year he’s not really felt good about the way the track flows. The season is still young so there’s plenty of time for him to catch up. As for Brandon, there are five events left for him to chase that rookie of the year title. Although I know for a fact that no matter what happens, both drivers will continue to get behind the wheel. It’s their happy place.